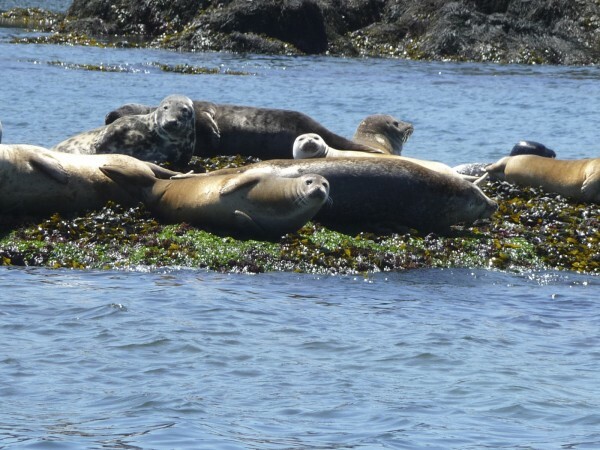 Seals bask on small rock islands in the sun in the Bay of Fundy between Eastport and Campobello Island in August 2011. PORTSMOUTH, N.H. — As authorities wait for answers in the deaths of dozens of seals found on beaches in New Hampshire, Maine and Massachusetts, there has been discussion about a similar event that happened from 1979 to 1980. Marine biologist Scott Mercer of York, Maine, told the Portsmouth Herald that many dead seals that washed ashore at the time had a strain of avian, or bird, flu. A spokesman for the New England Aquarium in Boston said there’s no information showing bird flu could be to blame for the 49 seal deaths recently reported in the three states. Tony LaCasse says only pups are dying this year, which was not the case 30 years ago. He says it will likely be late this week before results are in on necropsies performed on the animals.